This month I am in the middle of delivering another very cool online offering with Beehive Productions on the art of invitation. It’s a three session program focusing on the practice of invitation as it relates to participatory meetings, longer term participatory strategic initiatives and even organizational design. Michael Herman will be joining us next week for the “Inviting Organization” module. He’s really the guy that got me thinking about invitation way back in 2000 when I first came across his work as an Open Space colleague. 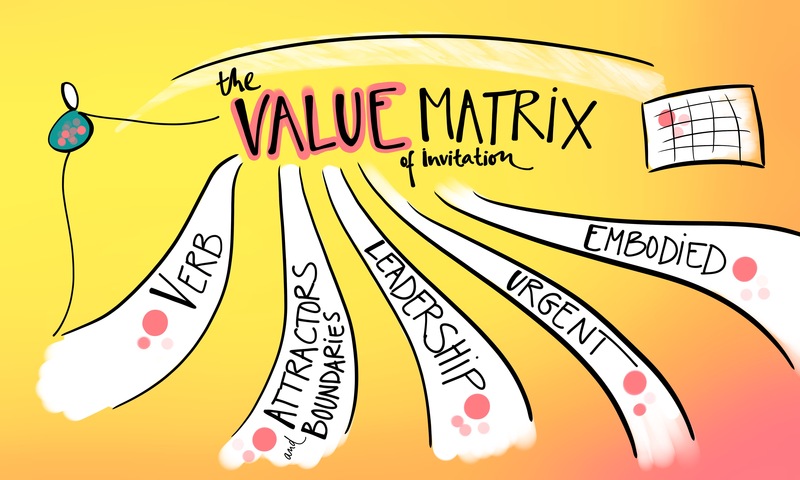 While Rowan and Amy and I were thinking about content we discussed some of the essential practices of invitation that facilitators, leaders and process designers should keep at hand. As we did when we discovered the “PLUME” mnemonic for harvesting, we arrived at VALUE as a mnemonic for invitation. Finally, invitations are EMBODIED: You cannot just send a text, or invite somebody to something while signalling your distinct lack of invitation with your body and behaviour. Recently, there has become a trend among American high school students to do fantastic invitations to prom dances. Like bower birds, young American men are going completely over the top to wow their dates. You can say what you want about it, but there is no doubting the fully embodied commitment to invitation expressed by this guy. How are your invitations?